Cies Islands consist of three islands: Monteagudo, Faro and San Martiño. I was curious about Cies Islands since The Guardian elected Rodas beach, at Cies Islands, one of the best beaches in the world. It is pretty close to Portugal so I decided to give it a try. First of all, if you pretend to stay there and you don’t like to camp, you should change your destination because the campsite (at Faro island) is the only place available to spend the night. On the other hand, if you like to camp, I’m sure that you will have a great time! Below I describe some important information that could help other travellers like you when visiting the beautiful Cies islands. When I say everything I mean campsite, if you pretend to stay there, and ferry. They have limited daily visits allowed in the island and if you don’t book in advance there is a possibility that you will stay on shore. You can reach Cies Islands by boat mainly from Baiona, Cangas or Vigo. I checked several companies and all of them have similar prices so my advice is to choose the one that better fits your schedule. I chose Mar de Ons, once it is the one with more daily trip options. Moreover, Mar de Ons has big boats which is quite nice if you tend to nauseate :p. A return ticket costs 18.5€. You can check schedules and prices here. Take in mind that if you pretend to spend the night there you will need your campsite reservation number to book the ferry tickets! After the reservation you will need a confirmation e-mail. The confirmation e-mail is not your ticket, you will have to bring this e-mail, with the reservation number, and collect your tickets at Centro de Recepción de Visitantes de Turismo in Vigo (google pin here). Be there approximately 15 to 30 minutes before departure. A small tip – you can charge your phone on board (remember that you are going to an island! ), they have some power outlets close to the windows. Once it is not possible to bring cars to Cies islands you will need to leave your car in the continent. From where I left, Vigo, I can tell you that there are plenty of safe parking lots available. The cheapest parking lot that I have found was 15€/day. I searched a few parking lots and all of them had similar prices (even if a bit expensive…). Be aware that there isn’t any ATM at the island and payment with card it is only available from 5€ in the campsite café and 12€ in the other restaurants. Bring some money with you. There are a few fountains in the park with potable water. Everything that is sold in the island is overrated so if you want to save some money, this is nice to know. In case you drink a lot of water my advice is to bring a 1.5L bottle with you once they only sell 0.5L bottles in the campsite. Be aware that you are in an island with limited access to potable water so, for this and plenty of other natural reasons, do not waste water! The only trashcans/containers available at Cies islands are in the campsite, so it means that if you are not planning to stay there longer than one day you will need to bring your trash back to the port of departure. 7. What to do there? Relax at the beach (of course): this one is mandatory. The beaches are beautiful. Just be aware of adventurous seagulls that are always trying to still people’s food! Do not feed any animals in the island, human food is not healthy for seagulls and other animals that live there. 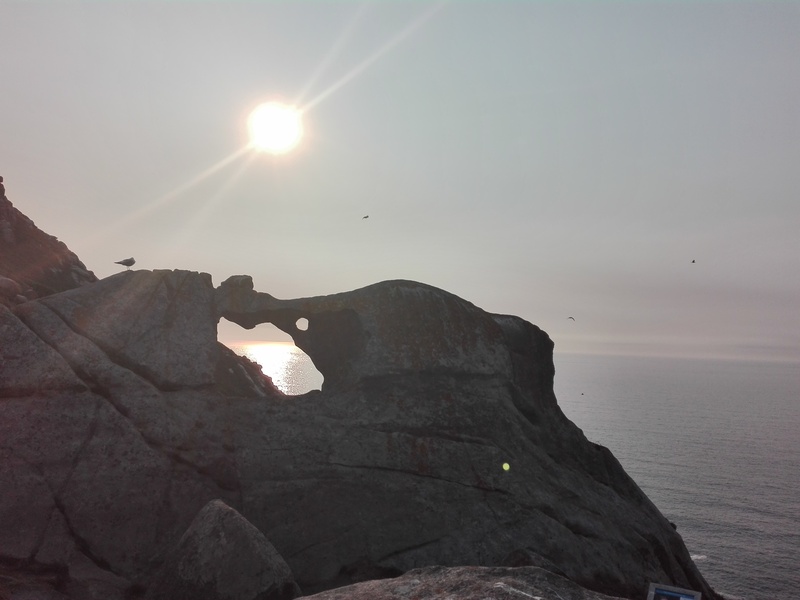 Hiking trails: There are 4 hiking trails at Cies islands. Each trail has a different distance, duration and difficulty level so just choose the one that fits you the best. I recommend the Faro (Lighthouse) Mountain trail to see the Campá Stone and the sunset at the lighthouse. The views are amazing and the trail is quite easy in my opinion. Note that it is only allowed to access the different parts of the island by those trails. The campsite has some free activities like night trails to watch the stars and others. It also has activities for kids. I didn’t explore it but I know that they have other activities like kayaking and snorkelling as well. Those are not for free. There is a small supermarket at the campsite. You will only find the basic products there. You can also find gas cartridges and butane canisters there. Don’t be surprised with the prices, everything is overrated there, so try to bring what you need with you to the Island. There are 3 restaurants and a café. Once again, they are expensive. As I said above the only place to sleep at Cies Islands is in the campsite, in Faro island. They have some tents to rent (that almost look like normal rooms) or you can bring your own tent, it is up to you. The campsite is really nice! The price per night depends naturally on the season of the year. On the high season, from June to August, it costs 25€ per night (2 people and 1 tent). You can check the prices here. It is worth the money, remember that you will sleep in a natural reserve. There are some baggage carts at the main entrance of the campsite. They can avoid you some back pains! Remember that cars are not allowed in the island so those baggage carts can be really helpful. I always found them at the main entrance of the campsite, so it means that when arriving at Cies island port (approximately 800m to the campsite) you probably won’t find any cart. If you are going with someone, one of you can always go get a cart at the campsite and return to catch you and all your stuff. Please remember to put back the baggage cart at the main entrance after using it. This is the minus of the campsite. Showers have cold water for free… Yes, this means that if you want to have a hot shower you will have to pay. You can always take a deep breath and give it a try or pay a few cents and have a comfortable shower. You can pay 0.2€, 0.5€ or 1€, the higher the amount, the longer you will have hot water. The trick here is to put in the machine 5 coins of 0.2€ instead of one of 1€, you will get more credits this way (don’t know why but it works). There is a big freezer available at the campsite, just by the side of the restaurant. The freezer is not in the best conditions but it’s still doing its function quite well so it’s OK. It is not easy to find it but ask some employee and they will kindly help you. In the Ferry boat: At least in the ferry of Mar de Ons they have electric outlets available in the ship, just try to find a place close to the windows. Campsite sanitary facilities: There are a few outlets here. I think you will easily find a free outlet to charge your phone. The minus is that you will need to stay there, of course, while your phone is charging. Close to the campsite reception: You can leave your phone close to the campsite reception for charging. This is free of charge and nice once you can leave your phone charging and come back later. Just ask the ladies at the reception, they are really nice. Power bank: If you have a portable charger than bring it, it will be really helpful. The campsite has free WiFi available. It doesn’t always work but it’s better than nothing. Regarding the mobile network it worked pretty well. The lighting at the campsite is quite poor at at night so bring a flashlight with you. During the day, in the high season, it’s quite warm but it can get cold at night so bring a sweater with you. Previous Post Where to search for nice flights? The best flight finders, explained. Hi there very cool web site!! Man .. Excellent .. Amazing .. I will bookmark your blog and take the feeds also?I’m satisfied to search out numerous helpful info here in the publish, we need work out more strategies on this regard, thanks for sharing. . . . . .
Nice post. I was checking continuously this blog and I am impressed! Extremely useful info particularly the last part 🙂 I care for such information a lot. I was seeking this particular information for a very long time. Thank you and best of luck.